HYDROPURE™ contains premium muscular building blocks to support efficient gains and repair/maintain lean muscle tissue at any time of the day. This elite protein supplement is ultra-refined for purity and hydrolyzed for efficient absorbtion into the body. This means your muscles get the dense macro-nutrition they need faster than ever. Whey also happens to be the most biologically potent isolate on the planet. It’s fairly easy to build muscle if you combine a high-protein diet with a consistent weight-lifting routine, but how easy is it to achieve a super-lean muscle tone? Not very. Many bodybuilders and other athletes strive for that shredded look but few achieve it when their protein intake is still high in fats. 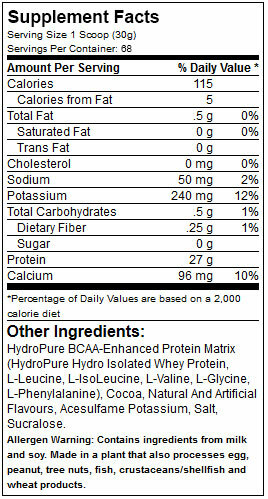 HYDROPURE™ utilizes the purest form of hydrolyzed whey protein to maintain maximum protein and minimal calories. Besides boasting a massive 28g dosage of protein, it is also completely carbohydrate and fat free (*chocolate contains 0.5g carbs and 0.5g fats)! This lean, mean formula is specially design to provide the support you need to build and maintain astonishing muscle size and definition. HYDROPURE’s™ concentrated whey protein isolate is refined with the most scientifically advanced hydrolyzation process available. Hydrolyzation works by seperating fats and lactose from the whey and creating small peptides or bonds that link the amino acids of the blend. The result is an ultra-pure blend with an unmatchable protein ratio of over 93% protein in every serving! The other benefit to the hydrolyzation process is that the protein is now designed to be easier for your body to digest and absorb, making it very efficient when you are looking for instant nourishment. 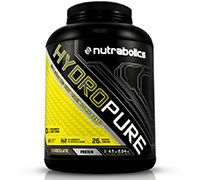 HYDROPURE™ utilizes whey in its most perfect form. This hydrolyzed isolate is ultra-refined for purity, digestibility, and bio-availability. In addition to containing zero carbs and zero fats (*chocolate contains 0.5g of carbs and 0.5g of fats), HYDROPURE™ is also gluten-free! This means optimal muscle growth that caiters to athletes with Celiac disease, gluten sensitivity, or simply those wanting to streamline their diet. For males: Mix 1-2 scoops (equaling approx. 28-56 grams of protein) with 7-14 oz. of cold water or other desired beverage. Vary the amount of liquid to achieve desired flavour and consistency. Drink 2-6 servings daily, or as needed to satisfy your protein or muscle enhancing requirements. For females: Mix 1 scoop (equaling approx. 28 grams of protein) with 7 oz. of cold water or other desired beverage. Vary the amount of liquid to achieve desired flavour and consistency. Drink 2-4 servings daily, or as needed to satisfy your protein or muscle enhancing requirements. With the purest protein ratio of all protein supplements at over 90%, whey hydrolysate is truly the most elite muscle-building nutrient source available. In addition to being totally fat-free*, carb-free*, and gluten-free, hydrolyzed whey also undergoes a process that pre-digests the protein molecules in the formula, resulting in rapid dissolution and absorption by your body. (*Chocolate flavour contains 0.5g of fats and 0.5g of carbohydrates). WHY IS LEAN PROTEIN CRITICAL TO MUSCLE BUILDING? Protein is absolutely essential to accumulate new muscle tissue; without the right amount and variety of quality protein you simply will not grow, no matter how hard you train. Bodybuilders need roughly 1 gram of protein per pound of bodyweight. That means a typical 220 pound bodybuilder should take in 220 grams of protein every single day! Accessing the super lean food protein needed to make fat-free gains can be tough to do on a busy schedule. This is where the right protein powder can be an athlete’s secret weapon. Just mix up a premium HYDROPURE™ protein shake for a huge dose of super-clean protein with zero fat. HYDROPURE™ utilizes whey in its most perfect form. This hydrolyzed isolate is ultra-refined for purity, digestibility, and bio-availability. In addition to containing zero carbs and zero fats (*chocolate contains 0.5g of carbs and 0.5g of fats), HYDROPURE™ is also gluten-free! This means optimal muscle growth that caiters to athletes with Celiac disease, gluten sensitivity, or simply those wanting to streamline their diet..
Other Ingredients: HydroPure BCAA-Enhanced Protein Matrix (HydroPure Hydro Isolated Whey Protein, L-Leucine, L-IsoLeucine, L-Valine, L-Glycine, L-Phenylalanine), Cocoa, Natural And Artificial Flavours, Acesulfame Potassium, Salt, Sucralose. Allergen Warning: Contains ingredients from milk and soy. Made in a plant that also processes egg, peanut, tree nuts, fish, crustaceans/shellfish and wheat products.